Take advantage of the seasons perfectly fresh peaches and blend up a batch of this delicious and refreshing Fresh Peach and Honey Lemonade. Only four ingredients and all of them are clean. Disclaimer: This post includes affiliate links, and I will earn a commission if you purchase through these links. 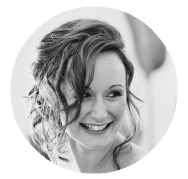 Please note that I’ve linked to these products purely because I recommend them and they are from companies I trust and use myself. We have been enjoying homemade lemonade on tap for the past couple of weeks. It is so so hot (seriously, it is over 100F every single day, with not a drop of rain in sight), and nothing screams summer quite like some homemade lemonade. We are so lucky to be able to use lemons and peaches from our own yard…now all I need is to convince the hubby to let me do some bee-keeping and we are in business. 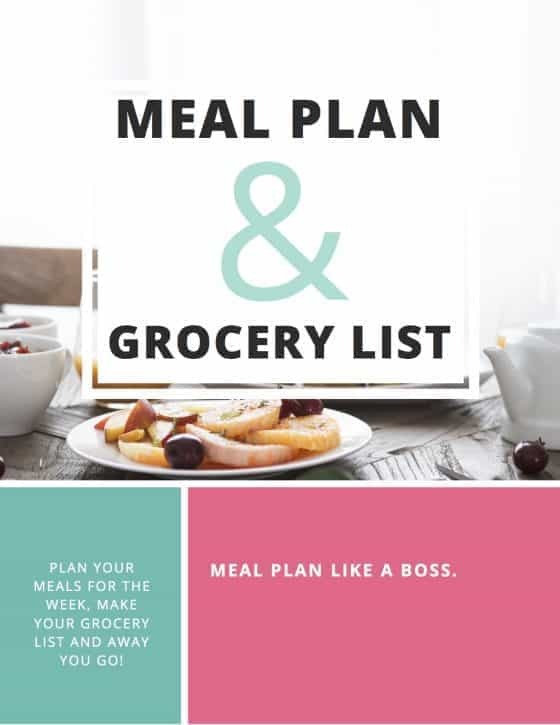 With peaches in season right now, you should be able to pick some up at a good price from the local farmers market, or supermarket. How Easy Is It To Make Honey Lemonade? This fresh peach and honey lemonade couldn’t get any easier to put together. You pretty much pop everything into the blender and just blend it up until everything is all smooth and delicious. Tip: if you want to make sure it is super smooth, then you might want to remove the fuzz from the peach before blending. For a foolproof method on how to do so check out my tips here: How To Perfectly Peel a Peach. Can I Spike This Honey Lemonade? Why yes you can, good thinking! 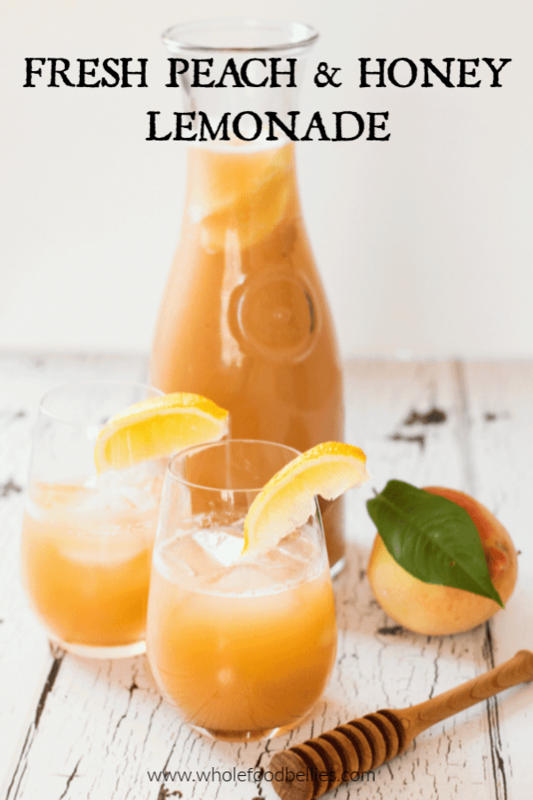 I recently discovered at a playdate that this fresh peach and honey lemonade actually pairs quite well with some fruity white wine or bubbles. It makes for quite the refreshing hard lemonade if you are into that kinda thing! If you have any leftovers you can always pop them into some popsicle molds and keep them in the freezer for another day. I like to use these ones as they are easy to get out of the molds. 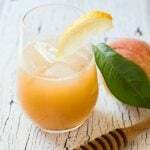 Take advantage of the seasons perfectly fresh peaches and blend up a batch of this delicious and refreshing Fresh Peach and Honey Lemonade. Only four ingredients, and all of them are clean. Oh I will keep pushing alright 🙂 He will cave eventually! Fresh homemade lemonade is so so good, the store bought stuff is just so sweet. I like the way you think! Bubbles in this would be amazing, and you know how I roll! I love the combination of flavors, and it sounds so refreshing and perfect for the summer! You and I are going to be best friends if those are the kind of “playdates” you like! I have everything I need (including the wine and bubbles) for this peachy-lemonade and I’m feeling really parched right now. Thank you for the idea! Haha these are definitely the type of playdates I like 🙂 I am lucky to have found a group of like minded mums!! I’m so jealous of your lemon and peach trees! I’ve got a baby lemon tree, but so far it’s too small for fruit. And no peach tree for me! I would LOVE to bee-keep though! This lemonade sounds heavenly!